Benjamins are proud to bring to the market this premium detached family home which offers very generous and flexible accommodation built approximately to 3,300 sq ft over two floors with a detached garage. The property displays an array of impressive features and is flooded with light providing an extremely welcoming living environment which is ideal for modern day family occupation. The property offers the perfect blend of countryside and village living with local amenities on offer in the neighbouring village of Keyworth. A particular highlight of this property is the open views overlooking the adjacent Stanton on the Wolds Golf Course. The property briefly comprises of a part vaulted reception hallway providing access to the principal ground floor accommodation including large living kitchen, spacious sitting room, a further reception room which is currently used as an office but would make a relaxing sitting room with the views on offer. The ground floor accommodation is completed with a bedroom with a en suite shower, high quality family bathroom and utility room. A traditional staircase rises to the first floor to a spacious open landing. The first floor accommodation includes a luxurious master bedroom with en suite shower room and dressing area, three further double bedrooms and a family bathroom. An extremely large welcoming space with stairs leading to the first floor, doors leading to the sitting room, bedroom one and the ground floor family bathroom, two radiators and a double storey sized double glazed window to the side elevation which lets in an abundance of light on a pleasant day. As you come back on yourself the inner hallway leads to both the Living Room and Kitchen. Having been rebuilt in 2004 this spacious family area is lovely and bright due to multiple windows to both the front and side elevations, radiator, wall mounted lights, Gas fireplace. This generous sized kitchen dining area was completely redesigned and refitted in 2004 with granite work surfaces and storage underneath, wall mounted cupboards, stainless steel sink and half bowl which is the waste disposal unit with mixer tap over, oven with six ringed gas hob and extractor fan over, spotlights, one pendant light fitting in dining area, radiator, two large double glazed windows to the side elevation and door leading to the Utility Room. Plumbing for washing machine and dryer, stainless steel sink with mixer tap over, granite work surface with wall and base storage units, door leading out to the garage driveway. This room boasts stunning views overlooking the rear garden which leads on to the well known and respected Stanton-On-The-Wolds Golf Course. The rest of the room consists of double glazed windows to the front, side and rear elevations, built in storage cupboards, fitted desk unit with cupboards and draws, radiator, pendant light fitting. This bedroom is on the ground floor with double glazed window to the rear elevation, built in wardrobes and built in dressing table, radiator, views overlooking the rear garden and golf course. Three piece En Suite showeroom off bedroom one which was refurbished in 2004 with pedestal wash hand basin, low flush w.c, glass screened shower cubicle with tiled wall, heated towel rail, obscure window to the rear elevation. Four piece family bathroom which was also refurbished in 2004 with integrated bath tub in marble surround, marble tiled floor, pedestal wash hand basin, low flush w.c, chrome heated towel rail, shower cubicle with shower head over, obscure window to the rear elevation. 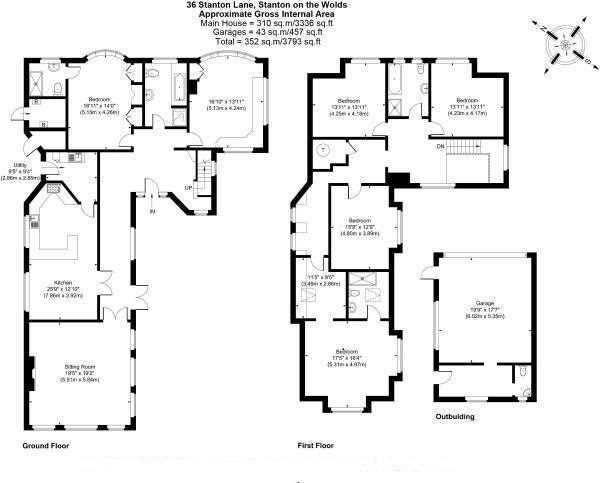 Windows to the front and side elevations, two radiators and doors leading to all four bedrooms and family bathroom. Double glazed window to the rear elevation, t.v point, radiator, pendant light fitting, views overlooking the rear garden and golf course. Four piece family bathroom with panelled bath, pedestal wash hand basin, low flush w.c and glass screened shower cubicle with shower head over, partly tiled walls, heated towel rail, two obscure windows to the rear elevation. Double glazed window to the side elevation, two inset downward spotlights, radiator, pendant light fitting. From the end of the first floor landing you first enter a dressing area (3.49m/11' 5") x 2.86m/9' 5") with a velux window to the side elevation before coming to the main bedroom. The room is extremely spacious with windows to both the front and side elevations, two radiators, inset downward spotlights and another door leading to the en suite. Three piece en suite showeroom with pedestal wash hand basin, low flush w.c, glass screened shower cubicle with shower head over and tiled walls, tiled floor, chrome heated towel rail, velux window to the side elevation. The property is situated in a beautifully mature plot of approximately 0.44 of an acre with good sized and well maintained gardens to both the front and rear of the property. The approach towards the property is a sweeping in/out driveway which continues all the way around the property. There is ample off road parking as well as a detached garage with workshop area and gardener's WC to the rear. There is also a boiler room with storage space, another smaller storage room by the rear kitchen door. The gardens are well planned and there are various areas that benefit from sunlight at different times throughout the day. The rear garden backs onto Stanton on the Wolds Golf Course providing stunning views as well as a private gate which will ideally suit those with a passion for golf. 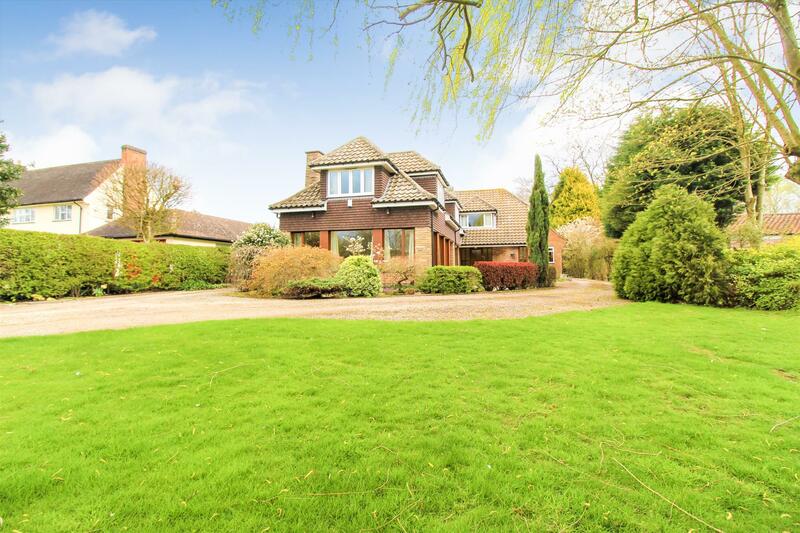 Stanton Lane is a prime residential address within Stanton on the Wolds, a sought after South Nottinghamshire village. The neighbouring village of Keyworth offers a wide range of services and amenities including a medical centre, two dentists, various supermarkets and other facilities helpful to day-to-day life. Keyworth also offers schooling at both primary and secondary levels. For the commuter there is ease of access into Nottingham city centre as well as various road links including the A52, A46 and M1 motorway. For those needing to travel further afield there are various rail links including East Midlands Parkway, and East Midlands Airport is approximately 15 miles away.